Do not resuscitate (abbreviated as DNR) is a medical order given when a patient does not want attempts to be made to bring them back to life when they die. Note that this can be a complex and sensitive subject. This article is for educational purposes only and should not be considered professional medical advice. 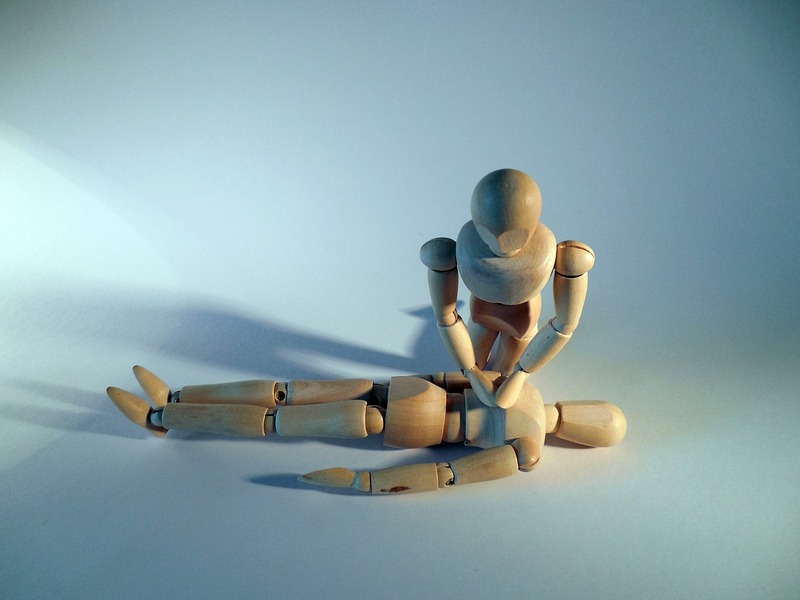 The resuscitation part of DNR primarily refers to cardiopulmonary resuscitation (CPR) which includes chest compressions and rescue breaths. But it often also includes advanced cardiac life support (ACLS) which is the use of cardiac drugs and electric shock therapy with a defibrilator, and intubation which is the insertion of a breathing tube. Although that may sound simple enough, there are multiple layers to this subject. The terminology along with the order itself might be different depending on where you are. The details should be discussed in full in order to clarify any misconceptions you or the patient may have. Patients should know that these things can often cause unwanted trauma. Chest compressions often breaks ribs and intubation often causes injury to the trachea. That's not to mention the fact that people who have successful resuscitation can suffer from irreversible brain damage. These potential issues may be enough to convince a patient to become a DNR. Do not attempt resuscitation (DNAR) may be used in an attempt to clarify the fact that resuscitation isn't usually successful. This helps the patient and their family understand that if an attempt is made, it doesn't necessarily mean that person will be brought back to life. Allow natural death (AND) may also be used in order to sound more humane since DNR may be interpreted as giving up on the patient. It should be emphasized that this is not the case. Do not intubate (DNI) is another term that relates to DNR but can technically be a separate order. However, this gets problematic because they often go hand in hand with intubation often following successful resuscitation. The opposite of DNR would be a full code. This means that everything will be done in order to keep the patient alive. This is the default order for patients admitted to the hospital until a change is made and confirmed with the signature of a physician. It must be written out on a document for a do not resuscitate order to become effective. A patient simply stating that they want to die naturally, or having it charted in a computer based medical record is not enough. The order must be clear and the patient must fully understand the order and be mentally capable of making their own decisions. The DNR form has to be signed not only by the patient or their durable power of attorney for health care, but by a physician as well in order to be put into effect. 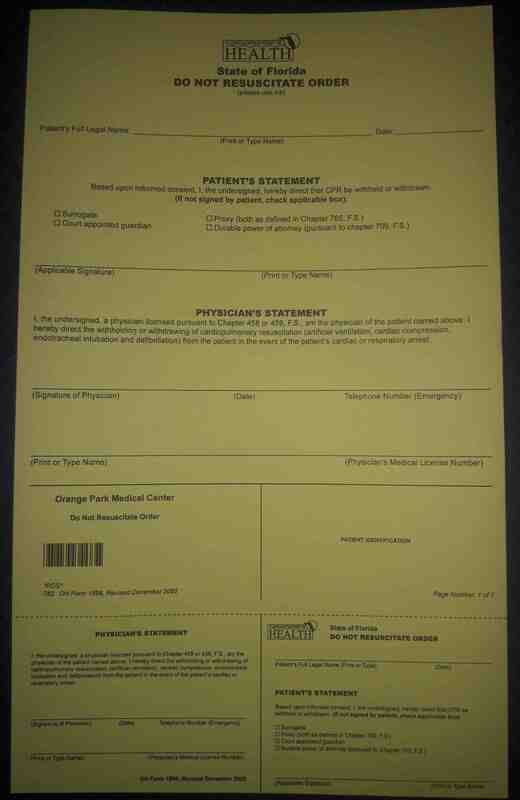 The form is often placed in the patient's chart in clear view and is usually yellow so it stands out (example pictured). That form is the defining factor. What If They Can't Make Decisions? If the patient is not capable of making their own decisions, then it may be assumed that the decision will be made based on their advance directive or living will. However, depending on where you are, such as the United States, these forms may not be enough since they are not considered legally binding documents. The yellow DNR form has the final say. If the patient has a durable power of attorney for health care, then that person will make the decision to either keep the patient as a full code, or sign a do not resuscitate form in their place if they feel that would be in the patient's best interest. Until then, the patient legally has to be treated as a full code. How do you approach a patient in order to find out if they want to become a DNR? It isn't always an easy topic to discuss. It should be brought up very delicately. This is a sensitive subject to many people and they may not even want to discuss it at first. However, it should be emphasized that it is an important part of their treatment, especially if their health is declining or they are in critical condition. You should make sure they understand that do not resuscitate does not mean do not treat the patient while they are still alive. 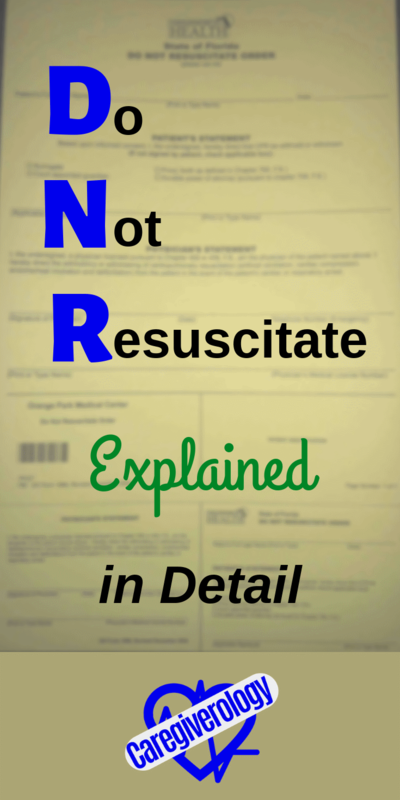 DNR is specifically for when the patient is no longer breathing and their heart stops beating. As long as they have a pulse and respirations, they receive full medical treatment.